Amy Applegren was getting a paycheck for playing professional baseball before she was out of high school. Graduating from Peoria Manual in 1945, Applegren had already played one full season in the All-American Girls Baseball League in 1944, the second year the league, founded by late Chicago Club owner Phil Wrigley, was in existence. The league lasted for a dozen seasons, from 1943 through 1954 and Applegren, a lefthanded pitcher and first baseman who earlier had pitched for the Caterpillar Dieselettes, played in all but the first and last seasons. This was major league baseball for women and only a few played as long as Applegren or saw as many changes in the game. Over the years the pitching rules were changed nine times while she was hurling: the size of the ball was reduced four times and the mound was moved back five times. She began playing for the Rockford Peaches in 1944, one year after the team that was featured in the hit movie "A League Of Their Own". Later she was with Muskegon, went back to Rockford and ended with South Bend in 1953. And during her eight-year pitching career they kept changing pitching rules. In 1944 the ball was 12 inches in circumference, pitchers pitched underhand and the distance to home plate was 40 feet. 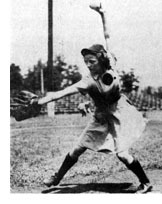 In her final years the ball was 10 inches, pitching was overhand and the distance was 55 feet. 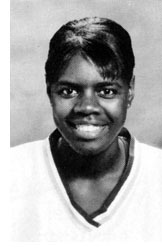 In all, she pitched in 205 games, played in a total of 386, had a 94-91 pitching record with an ERA under three her first three years and then two of 1.06 and 1.76. Peoria was part of the league from 1946 through 1951 but Applegren never had a chance to play for her hometown, just against it.